What inspires you? It’s a deep question, I know. Take your time. Want to know what inspires the money-makers over at Nike? Chicken and waffles. How anyone got from soul food to apparel for soles, well, they had to have smoked a lot of ganj, but nonetheless it resulted in a $110 product that’s selling like hot cakes (well…waffles). 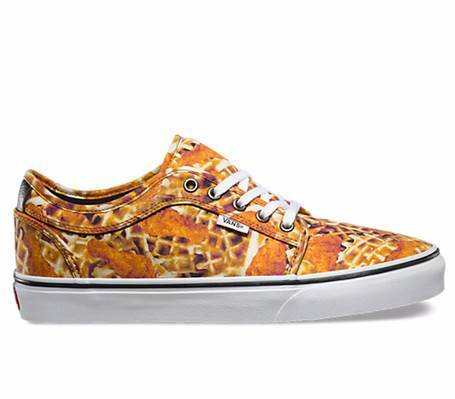 It turns out that Nike isn’t the only one with chicken and waffle sneaks, Vans also makes soul-food inspired kicks. Which makes me wonder, could chicken and waffle shoes become the next pizza trend? Yea, I know, the deep thoughts just keep on comin’. Guess it’s true when they say breakfast is the most important meal of the day.